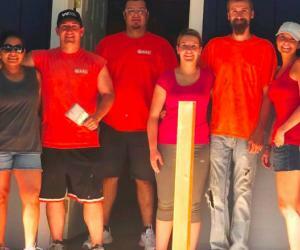 AEC’s volunteer team recently helped paint the exterior of a brand new Habitat for Humanity home. Our crew met up bright and early with other Habitat volunteers to apply two coats of new paint to the home for a qualified family. Cowlitz County Habitat for Humanity works to make the dream of home ownership a reality for deserving families in the area. AEC is happy to embrace opportunities to help our local community and give a leg up to those eager to improve their lives. We appreciate our team of volunteers and their families who participated this year, and look forward to giving more of our time to help those around us!